The Arrowhead region of northeastern Minnesota and northwest Wisconsin boasts 15 craft breweries and brewpubs, producing nearly 20,000 barrels of convivial suds annually. For perspective, that’s about 600,000 gallons or 40,000 kegs or 5 million pints or 6.5 million 12-ounce bottles and cans. When it comes to craft beer, of course, it’s a game of quality over quantity. So although the list below is stacked by order of the largest producers, obviously it is taste that matters most (though the latter is clearly subjective and difficult to rank). Some of the production numbers below are fairly precise, while others are estimates and subject to caveats, so our 6.5-million bottles/cans figure is the result of a lot of rounding off. It should also be noted that while the 2014 production figures might seem impressive, it is a far cry from the amount of beer produced in this neck of the woods back in the good old days. In the 1940s, for example, the old Fitger’s Brewing Company was producing about 100,000 barrels all by itself — and it was far from the only brewery in the region. (Zenith City Online notes numerous defunct Duluth breweries in its feature “Commercial Beer Brewing in Duluth (1850s–1970s).”) With that perspective stated, here is Perfect Duluth Day’s list of craft breweries/brewpubs and their stats. I think CPB has a different brewer now. We have updated the post to note Jonathan Portinga is the interim head brewer at CPB. Thanks for the heads up, John. The first brewpub in the area that offers a Schlemiel Schlimazel beer with a hasenpfeffer stew gets my money. And undying admiration. 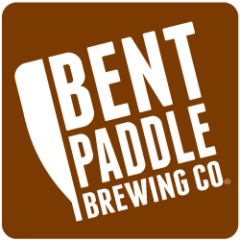 Paddle Break Blonde is back and now available at Bent Paddle's tap room. It hits liquor store shelves in Duluth/Superior next week and all other areas the following week.